Yesterday was the big day for the Barkley Fall Classic. When we checked in on Friday I had volunteered to help if they needed me. And the nice race director said he had a good spot for me. He gave me a bright yellow safety vest and a hand-held Slow/Stop two sided sign and instructions about where to go and when to be there. It was my job to help the runners get across a road and direct them on their way. After the race got started, I drove to a convenience store and bought a couple of snacks and then went on to my assigned location. I was there not very long, maybe half an hour, when a nice lady from Atlanta stopped by to make sure I had what I needed. Then a nice couple from Vermont also came. The lady from Atlanta had duties in another spot so she went off to do that. The Vermonters stayed all day with me. So, there seems to be some secrecy about the course of this race, and it is not my object to diminish that. But, a brief description seems to be safe enough. There was very rough gravel (large chunks) road coming down a pretty steep incline, and ending at paved two-lane road. We were set up at that point. Runners would come down the inclined gravel and we made sure the traffic was OK for them to cross the road. Actually, they were to continue on the road for about half a mile to the next checkpoint then they would go off into the woods again from there. I had the Slow/Stop sign. The other folks were giving the runners instructions to stay on the left, watch for cars, etc. We coordinated so that if any vehicles were coming I would put up Stop or Slow depending on any gaps in the flow of runners. The race started at 7 AM and the first runner came through about 10 minutes after 10 AM. Then there was a lull for about another 10 minutes and we started to see a regular flow. Since this was about half way in the 30+ mile race, the field was stretched out quite a bit. We didn’t have more than 5-6 runner people in our little work zone at any one time. We saw a few people come “down the road” instead of down the trail. I mean, not from where we were sending them to, but the other direction. Some folks had missed a turn in the trails and had come out on the same road further along, had run more then they were supposed to. We calculated that it added 30-40 minutes to when they probably would have come through had they followed the intended route. It was a winding road, fun to drive on. We saw a good variety of motor vehicles: motorcycles, three-wheel motorcycles, three and four wheeled ATVs, cars, 4-wheeler jeeps, regular cars, pickup trucks. We saw one Audi “supercar” thing; I think maybe it was the Audio R8. We didn’t have any full sized trucks nor bicycles. Most folks were obedient to our Stop/Slow sign. One guy on a motorcycle didn’t Stop for my Stop sign, but I think maybe he was watching the runners instead of watching my sign. It turned out OK, he weaved through slowly and it was all good. I estimate we had something like 200 runners come through. I didn’t keep any kind of count. Some of them were kind of loopy. We had to make sure they were actually heading down the road toward the next checkpoint. This run is known for some of the crazy terrain, going straight up mountains and through briar patches and stuff. I think that is the reason some of the people seemed to think we wanted them to go down off the road on the other side. But we caught them. We modified our directions to try to make that clear; in addition to “cross the road” we now added “stay on the road until the next checkpoint”. All this time of course I am watching for Mrs. H.
There was a cut-off time of 7 hours enforced at that next checkpoint. That time came and went. We still had maybe 8-9 people come through after that time. The Vermonters eventually left so I was on my own again. And she eventually came along. She and another guy were gimping along but making their way. They went on to the checkpoint. It is better to get blocked from continuing then to just sit down and quit. So cut-off times are sometimes a blessing in disguise! I went to the morning church service at a place nearby and that was good. Then we ate at Outback. 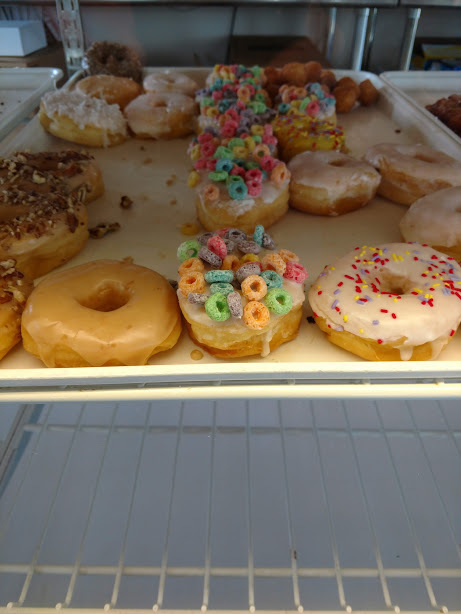 Then I wanted a donut so we drove to a donut shop I saw this morning on my way back from my little run: The Donut Palace. I only bought one (Oh the self restraint!). I bought an “old fashioned” but I took a picture of these donuts who were carrying their babies on their backs.